The Case of the Buried Bones by Lewis B. Montgomery. A Milo & Jazz Mystery. Review: Wait where is it? The time capsule is supposed to be here. 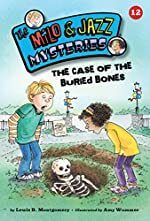 In the book from the Milo & Jazz Mysteries, The Case of The Buried Bones by Lewis B. Montgomery, will Milo and Jazz be able to solve this 75-year-old case? In Milo & Jazz Mysteries the Case of the Buried Bones, Milo and Jazz are solving the case of the missing time capsule. They keep getting tiny hints that they think are worthless. Will Milo and Jazz find the capsule or will Gordy the grandchild of the man who hid it find it first? The Case of the Buried Bones is perfect younger chapter book readers because it has easy words. It only contains simple words and is just a fun book to read. The author makes the setting clear and stays on track. For example, he tells you right from the beginning that it takes place in Westview. The book has simple vocab but you can learn a couple of new words here and there. I like how the author wrote the book in third person because I know what everyone is thinking not just the main character. The main lesson in the book is don't always believe what you read because it may try to mislead you. Review written by Jacob (6th grade student). We would like to thank Kane Press for providing a copy of The Case of the Buried Bones for this review. Have you read The Case of the Buried Bones? How would you rate it?